The answer to what is hives is, it is also known as urticaria. The main reason people suffer is because of the body's reaction to some allergens. It can also be caused by a number of reasons. These are not all fully understood. There are two types of hives, acute and chronic. Acute hives is the type brought on by an allergic reaction. It is mainly foods that cause it, though not always. The most common problem foods are shellfish, nuts, eggs and wheat. After contact with the allergen it can be just a matter of minutes before the symptoms appear. It can then last between a few hours or a few weeks. Chronic hives is the type that can be brought on by other factors. It is seldom because of an allergen. Most people who suffer don’t know what the cause is. What is hives caused by? It is thought to be an autoimmune response. This is when the immune system wrongly reacts to substances that are normally in the body. It treats them like a 'baddie' who is going to cause trouble. So it attacks them. It is more in depth than that but I have made it simple enough so even I can understand it! It appears when the body releases histamine. The body's own natural substance released by the immune system when the body is exposed to an allergen. It causes the symptoms of inflammation. Both types have the same appearance. But the chronic type tends to last over 6 weeks. In some cases it can last over 20 years. It appears anywhere on the body and varies in size. The rash consists of red bumps. These are extremely itchy. It is not contagious though. It can look a lot like the rash that comes from poison ivy. That rash is a form of contact eczema. 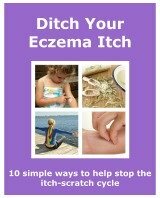 It also differs from eczema in that the skin doesn’t become too dry. The main way to manage urticaria is to recognise the triggers that start the outbreak. This can be difficult, especially if it is not just an allergy that is the cause. Blood tests and skin prick tests may be done to find out what the allergen is. Once an allergen is known and avoided, it makes it easier to manage. Unfortunately if it is not caused by an allergen then it is much harder to control. Especially if the cause is unknown. After managing the source of the problem the main treatment is a prescribed antihistamine. These can be taken regularly. They help to lessen the severity of the outbreak and any reoccurring outbreaks. If antihistamines don’t help with chronic hives, then glucocorticoids may be prescribed. Like any other skin compliant, finding the cause or causes is one of the best ways to manage it. You may be able to work it out yourself, or you may need further assistance from your doctor or dermatologist. If it is not caused by an allergen, the best thing to do is visit your doctor. Hives seems to be a lot more complex than the other skin complaints on this site.